We offer private Malaga Airport Transfer and Shuttles from Málaga Airport to anywhere in the Costa del Sol, Andalusia. Our headquarters are just in front of the Málaga Airport Arrivals Terminal, and of course the main service we provide is picking up people from the arrivals lounge and drive them to their destination. We will take care of picking you up again the last day of their stay to drive you back. Trust in our Málaga Airport Transfers service. Our 24 hrs phone service, will give you all the assistant you may need: our service is sure and reliable. We have a large fleet of new cars of all sizes you can see here. We are located in front of the Málaga Airport Arrivals Terminal and this are our best transfer deals. Your booking will be confirmed	in less than 24 hours. For those special moments in life. The moment you arrive at the ceremony to say "yes, I want!" We help you organize and plan transportation for congresses, fairgrounds, conventions, openings ... Throughout our fleet we have the latest GPS positioning technologies and we also have an efficient traffic department. We have in our fleet with minibuses and buses if it is a group and with V.I.P vehicles for executives and managers. We carry out Inspection Visits. Our services include transfers to the golf course with all its equipment, and subsequent return to the hotel. - We transport your golf equipment. trust in our services for your Málaga Airport Transfers needs and you will get the best value for money. of course, we will drive you there from anywhere in the area: you can get a quote! 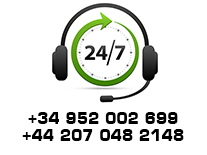 We have 24 hour assistance service. Reservations 365 days a year. with the name given by you while booking. with the corresponding green tie. to pick you up at Málaga Airport Arrivals on time. Don´t worry if the flight is early or delayed. You can request additional chairs for children. In cash or credit card at the end of your journey. You will receive a confirmation in less than 24 hours. Remember that you can always make your reservations through our phone! With more than 10 years of experience transporting persons in the Costa del Sol area, based nearby the Málaga Airport, we have become experts in this industry. Our main goal is to give our clients the best service while staying in our province, since the very first moment when you arrive till your last transfer to the airport, including any visit, excursion or extra transfer you may need. We take care of everything in order to you do not have to worry about any detail, only to enjoy your holiday or business trip. - 24 hours assistance service. - Reservations 365 days a year. - We will help you with luggage. - The driver will receive you handing a poster with your name. - All our drivers are uniformed with an elegant green tie. - We will be monitoring your flight arrival time to pick you up.